An 18-year-old student at the Kerch Polytechnic College in Crimea is being blamed for a mass shooting in a country with strict gun regulations. Kerch deputy head of city administration Dilyaver Melgaziyev told TASS, an official Russian state media outlet, that 20 people were killed in the incident and at least 50 wounded, 10 critically. The suspect in the event, Vladislav Roslyakov, was listed as a student of the college who later committed suicide. Russian Healthcare Minister Veronika Skvortsova said that most of the dead are under age 18. “Twenty people were killed, among them 15 students and five college employees. Eleven out of 15 students were under the age of 18,” Skvortsova said. Originally classified as a terrorist attack, which prompted authorities to send in Russian National Guard troops to protect both schools and the bridge connecting the Crimea with Russia proper, the event has since been reclassified Thursday as a murder. Nonetheless, the Moscow-installed Prime Minister of the Republic of Crimea, Sergei Aksenov, told reporters that armed guards would be posted near each school and kindergarten in the city moving forward. According to GunPolicy.org, hosted by the Sydney School of Public Health at Australia’s University of Sydney, Russia has gun laws that are considered restrictive. There is no right to private gun ownership. Handguns and select-fire rifles are outlawed and reserved for police and military use only. In the Motherland, those who are “granted hunting rights” have to first apply for a license to buy a smoothbore firearm such as a shotgun and have that license for at least five years before applying for a rifled weapon, which in turn must be registered. While there are an estimated 11 million illegal guns in the country, Russian state media reports that Roslyakov recently passed his background and medical checks for a pump-action shotgun last month and purchased 150 shells earlier in early October then used the firearm in Wednesday’s attack in addition to homemade explosives. Russian President Vladimir Putin has offered his condolences, promising an investigation into the matter as the nation is in mourning. At the same time, Ukraine President Petro Poroshenko is asserting any inquiry should be performed by his country, citing that the Russian annexation of the Crimea in 2014 is not recognized by international bodies. The attack in Kerch is not the only mass shooting in recent memory in the country. Russia suffered a church shooting in February that killed five and wounded four. 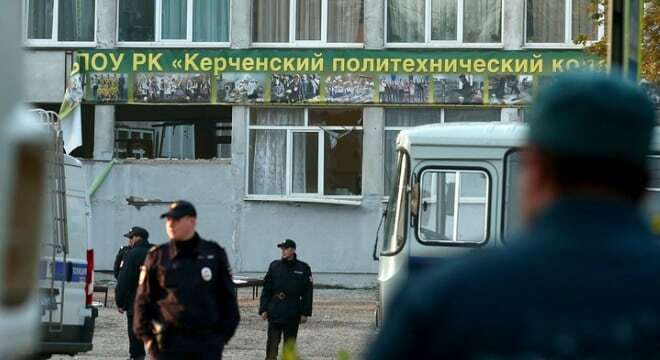 Meanwhile, BBC Russia reports there have been at least five other attacks on schools in the country so far this year, although Kerch is by far the worst.